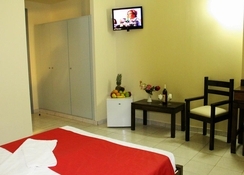 Porto Plaza Hotel sits along the beautiful Greek northern coastline just 23km from Heraklion International Airport. It’s well positioned within Hersonissos where you will have easy access to local conveniences including food and retail shopping, cash points and more. Once you reach your hotel room you’ll discover an elegantly designed interior that maximises the Greek sunshine with light colours. Also on-site, guests will be able to hit the gym or relax in the Jacuzzi and sauna. Don’t miss out on all the top attractions in Hersonissos where there’s a little something for everyone. You can learn about the local history at the Linchnostatis Open Air Museum, get wet and wild at Aquaworld Aquarium as well as explore the nightlife where you’ll find a plethora of nightclubs as well as karaoke bars. Dine in at the on-site restaurant El Greco which offers both local and international dishes or head out where you’ll find establishments serving traditional Greek cuisine, British pubs, Mediterranean grills and seafood and more. 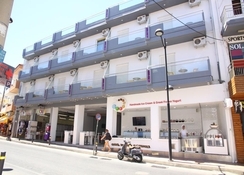 Porto Plazza Hotel is located 23km from Heraklion International Airport on Greece’s northern coast. The nearest beach is just a stone’s throw away from the hotel is just a 50-metre stroll. There are a plethora of restaurants of bars within easy walking distance as Porto Plazza Hotel is located on the main thoroughfare of El. Venizelou, so a short walk up or down the road from the hotel will see you encounter many options. Aquaworld Aquarium is just 500 metres north of the hotel whilst the local history museum, Linchnostatis Open Air Museum is just 5km away. 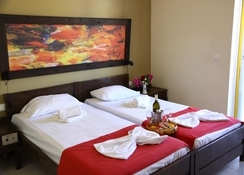 Porto Plazza Hotel contains 93 elegantly designed, clean and comfortable rooms. Standard rooms typically come with a double bed with an optional cot available on request whilst Superior rooms sleep up three guests and feature a more spacious design. All rooms come with standard amenities for a comfortable stay such as wi-fi, telephone, TV, hairdryer, air-conditioning, en-suite bathroom and private balcony with great views. The main restaurant, El Greco serves breakfast, lunch and dinner throughout the week. There are also several bars to choose from, these include a poolside bar which also has ice cream and snacks available and all serve a fine selection of cocktails, beers, wines and spirits. Also to be found on-site is The Beer House which is not only a great place to pick up a fine ale but is an ideal place to party the night away and enjoy special events such as Karaoke and disco parties. Out and about the hotel itself there are many great dining options available such as the White Lion Pub serves traditional British fare, Thalassa Café & Grill is an ideal spot to pick up something lighter. 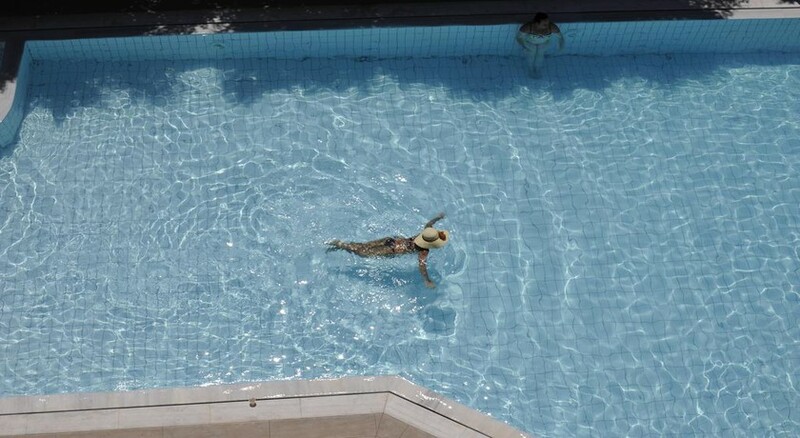 Porto Plazza Hotel offers several ways to relax and stay entertained. Guests can keep up their exercise regime at Flex Gym a fully-equipped gym. There is also a Jacuzzi and sauna to enjoy on-site too. Away from the hotel guests at Porto Plazza Hotel can explore many interesting places to see and things to do around Hersonissos. Explore the underwater world at Aquaworld Aquarium. Feel the thrills and spills of Star Beach Water Park with its water slides and pools whilst St. Paraskevi Church is a relaxing place to unwind and admire the architecture.